Are Blu-ray Players and Blu-ray Movies Worth Buying? A Blu-ray Disc (also known as BD or BluRay) is the same physical size and shape as a DVD but can store 5 to 10 times more information (25 to 50 GB data capacity) than a DVD which allows Blu-ray disks to store whole movies or several TV episodes in full 1080P high definition video, with much better sound quality than DVD movies and space for lots more extras eg: behind the scenes documentaries. 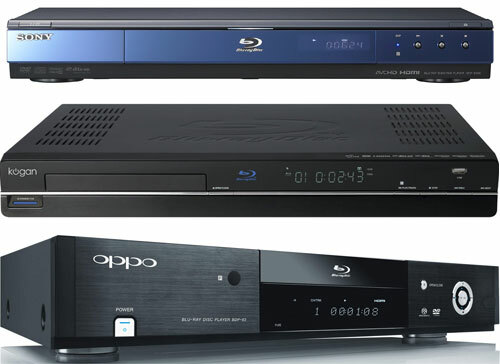 If you want to watch movies or TV episodes in Blu-ray at home you have to buy a Blu-ray player. Blu-ray movies and tv shows will not play in your old DVD player. However you shouldn’t fear that your huge DVD movie collection will be useless because Blu-ray players are backwards compatible and can play CD’s and DVD movies as well. In Australia at time of writing (early 2010), Bluray players cost anywhere from just over $200 eg: the budget Kogan Blu-Ray Player I recently tested to top of the line award winning Pioneer Bluray players which cost $600 to several thousand dollars. In general terms yes you do get what you pay for, a cheap Bluray player won’t be as good as an expensive one although the basic players are still quite decent. I suggest buying a Bluray player that matches your TV and budget. So if you own a budget HD TV, buy a budget Bluray player but if you own an expensive 1080P full HD TV that cost several thousand dollars, buy a quality Bluray player to match. Another requirement to enjoy a Blu-ray movie at full quality is to connect your Bluray player to your TV using component cables at the very least and preferably via a single HDMI cable. Lastly you can listen to the movie/tv soundtrack from a Blu-ray disk through your TV’s basic speakers but it is highly recommended to output the sound to a good multi-speaker sound system to enjoy the full audio experience. I’ve watched quite a few Bluray tv shows and movies sent to me for review by Universal Studios, Sony Pictures and Disney/Pixar during the last few months on High Definition TV’s ranging from a 32″ Kogan 1080P HD LCD TV to a 40″ Samsung 1080P HD LED Backlit LCD TV and various other TV makes when visiting friends. In general I’d say that the movies most worth buying on Bluray are the ones which are modern animated movies or other relatively new movies (10-15 years old at most) with lots of visual effects and a strong soundtrack. For example Terminator 2: Judgment Day was released in 1991 and watching it on an HD TV in Bluray format didn’t look much better than the DVD version. The same applies to old movies more than 20-30 years old like classic Westerns or Hitchcock thrillers. These old movies were never recorded at HD quality to begin with so buying them on Bluray will just waste your money. However newer drama/action movies like Gladiator and King Kong from Universal Studios with a brilliant soundtrack and great visual special effects respectively benefit a lot by being viewed in Bluray format on a big HD TV with a good sound system. Similarly, modern animated movies originally recorded with high digital video and sound quality like Disney/Pixar’s WALL-E, UP! and Universal Studios Coraline look far more rich and detailed in Bluray format compared to DVD. If your TV is smaller than 40 inches and not full 1080P HD, save your money and buy a cheap DVD player less than a $100 and keep buying movies in DVD format which is very good value these days. If you own a 1080P full HD TV 40″ inches or bigger in size it’s well worth considering purchasing a Bluray player to make the best use of your TV. If you own a big 1080P full HD TV as well as a good sound system then buying a Bluray player and movies in Bluray format is definitely recommended. One big issue with Bluray is image and sound quality versus is value for money. For example I’ve purchased 10 movies in the last month, all of them DVD’s. Why? because in the end as Sony Australia’s general manager of marketing said recently at a press conference I attended: “without content TV is just an empty box”. Since I only set aside a small amount of money for “non-essential stuff I want” it’s hard to justify spending eg: $100 to get 4 Bluray movies when I can buy 6-10 DVD movies instead. On the other hand if you have spare cash, want the best video and image quality and don’t mind spending roughly $10 more to buy a movie from an Australian shop in Bluray format instead of DVD then by all means go ahead. Personally, I restrict Bluray purchases to movies whose plot/story line I really like which also have great visual detail eg: WALL-E, UP! and Coraline. If you can find region-free Blu-ray movies being sold online they’re often much cheaper than the same Bluray movie sold in Australia and can save you a lot of money if you buy several together even after adding shipping costs from overseas. You can’t argue with the improvements in picture and sound quality of Blu-ray discs over DVDs but do some homework before you buy a Blu-ray player this Christmas. It could be wasted money if you don’t have a full-high-definition screen and good sound system to hook it up to. The other point is that most Blu-ray discs cost about $10 more than their DVD counterparts, which means you have to really want the improvements in picture and sound quality. I tend to buy Blu-ray versions of movies only when the vision or sound is critical. Otherwise I buy the cheaper DVD variants and rely on the video upscaling to bump up the picture quality. Both the VCR and DVD revolutions required that just a single revolutionary (in the case of DVD, evolutionary) product be successful. Your TV remained the same. Blu-Ray – unless you are not taking advantage of any of its, well, advantages – requires a whole new TV. Blu-Ray will survive, but will it be just for cinephiles? Don’t forget the impact of up-converting progressive-scan DVD players, which even Sony sells: I just bought one for $44.77 at Wal-Mart and driving the 720p display in my RV makes a standard-definition DVD of Charlie and the Chocolate Factory look amazingly good. Not good enough for a cinephile, but that’s five percent of the video market, tops. Yes, Blu-Ray is better, but for many people the incentives aren’t there. My problem with bluray is that many households have more than one dvd player with standalone players, computer drives etc. If you buy a bluray player, You still end up bypassing bluray discs & only buy dvds due to compatibility issues with your players. So either you end up spending a fortune upgrading everything or buy a Bluray player that ends up mostly used as a DVD player. On a very large screen, say over 50 inches, there is a visible difference between blu-ray and DVD. Blu-ray pictures seem to offer a more film like picture quality whereas DVD seems more video like. Backgrounds also appear more detailed so that individual details can be picked out. BluRay movies are nice to watch. However, the price tag can stun people and make people turn to the cheaper DVD version of the movie. Too expensive! Awesome picture quality though. And better interactivity than DVDs. A good overview Neerav. I think this will be the last physical media we’ll see now that increasing bandwidth allows streaming and/or downloadable hi-def content. After all, Blu-ray is really just an evolution of the wax cylinder right? I also concur with your view that it’s only worth buying modern movies. I can strongly recommend the opening scene of I am Legend (the surround sound of the Mustang driving around post-apocalyptic New York is amazing), and the CGI in District 9 looks even more incredible on a large screen. + Most Blu-ray players upscale standard DVDs which noticeably improves the visual quality of your old DVDs on a large screen. + Blu-ray movies typically offer more special features than standard DVDs – some pull content from the web, if your Blu-ray player is connected via ethernet or wi-fi. – All Blu-ray players I’ve used are frustratingly slow to load Blu-ray movies. I’ve had to wait 5 minutes or more to load up a movie on my Blu-ray home theatre system, though I’m sure this time will reduce as the players evolve. EDITOR: Hi Aidan. Although my Kogan bluray player is cheap n cheerful it manages to play most disks within 30 seconds. Perhaps you have an earlier model Bluray player? I’ll try updating the Samsung firmware again (no joy last time). My mate’s Samsung (different model, same UI) is just as ponderous. As big of a fan I am of blu-rays, I have to say that most of the remastered films of the old aren’t worth the purchase unless they are super cheap. I have about 60 or so blu-rays and only about 20 of them were truly worth thier price. Not everyone put the time into having remastering thier films as they did with The Fifth Element, for example. I imagine any films that are released from here on out will be pretty good as far as pq and sq are involved. We are advancing in tech so quickly, it will just be a matter of time before blu-rays will be the next DVDs. have to disagree the screen size on a 20 inch HDTV you can see far better picture on a blu-ray over a dvd. plus on Blu ray you watching the movie as it should be in 24 fps . you do not get the problem of pal/ntsc frames issues that dvds have. I don’t think they are worth buying, but the same thing can be said about DVD players about 13-15 years ago. However, blue ray might be a necessity in a few years, so we may not have a choice. They were recorded at better quality as film is better than Video. If you are not seeing a quality difference than the restoration job they did was bad. To prove you wrong watch both Casablance and the Searchers in HD. Sure animated films and FX movies can show off stuff but to say old moves were not recorded on a good medium as far as pictures goes is just plain wrong. Even though I agree that the Bluray disc price is still a little high, the same could be said about dvds 15 years ago. The Bluray players themselves are now getting to be a reasonable price ( about the price of what a DVD player ran for 10 years ago if not earlier. You also got to consider that most if not all bluray players can be connected to the internet , so you can run programs like Netflix without buy a seprate devise or game console. In my opinion , you can hold out on getting one but you are going to have to make that leap to bluray sometime since you won’t have a choice down the road. I wouldn’t personally go out and buy one just to get better picture. We’ve had our DVD player for nearly 8years and it’s still going strong with occasional glitch. So when it finally dies, we’ll get one to replace it.